Monday, September 03, 2018 - Former President Daniel Arap Moi turned 94 years over the weekend. 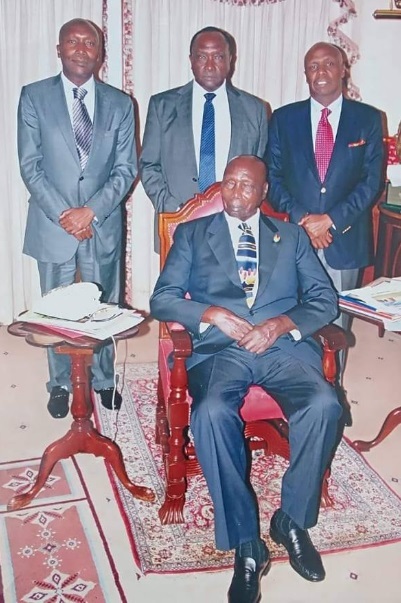 Moi, who ruled Kenyan with an iron fist for 24 years, celebrated the occasion with family members led by his son, Gideon Moi (Baringo County Senator), and friends at his Kabarak home. The 94-year old is a proud father of nine children; six sons and three daughters. They include, Gideon Moi, Raymond Moi, Jonathan Toroitich, Philip Moi, John Mark Moi and Nakuru Governor, Lee Kinyanjui. The daughters include Jeniffer Jumutai, June Moi and Doris Moi. The photo below shows Moi with three of his sons - Gideon, Jonathan and Raymond. Moi was married to one Helena Bomett simply known as Lena but fell out and divorced in 1979. She would keep a low profile until her death in 2004 and Kenya never had a First Lady throughout Moi’s Presidency.